Oh sweet Dave. I love that man so much. He's pretty much up for any DIY idea I have and I love him even that much more for it. For weeks, maybe months, I have wanted to paint a chevron pattern on our kitchen floor. This image has haunted me, guys. I was very close to doing it but then chickened out. I couldn't see spending that much energy on something that might be a fleeting trend, especially knowing me and my ever-changing tastes. So I decided to save my chevron for a later project. As you all know the office is in the midst of a makeover and it hit me that this was the prime-o destination for some chevron pattern in our lives. I knew what colors I wanted and how I was going to go about painting, I just didn't know how I was going to figure out all that math. You see, I'm a Spanish teacher, and I do Spanish. My family likes to refer to me as "math stupid". I take absolutely no offense because I have the math skills of a 6th grader, maybe. Ha. You may think I'm joking but 6th grade is being generous. Anyhoo, my sweet husband has a math brain and offered to help me with the planning! See, I told you I loved him so! 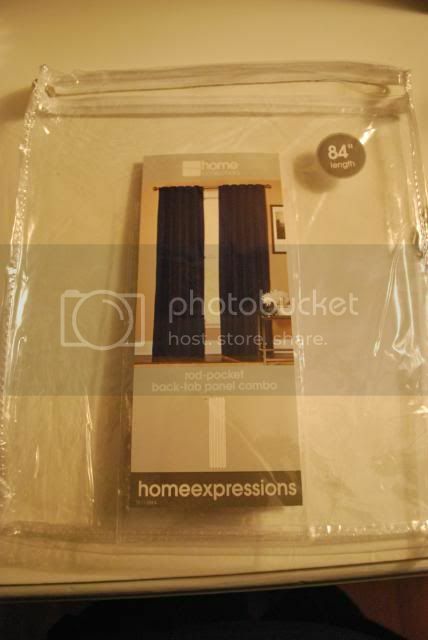 I first decided on these cheapie JCPenney drapes that cost under $20 a panel + a coupon, too! If the chevron pattern didn't work out on the first drape I had plans to return the rest. Easy peasy. 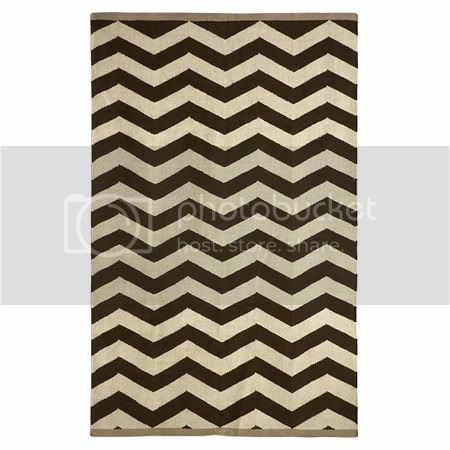 I showed David this West Elm rug and he kinda took it from there. I know there was a lot of measuring and dividing and he somehow ended up with a template. He measured all of the drapes for me and I got to painting. I don't think you'll be able to see, but there are faint pencil markings for me to use as a guide. Painting took what seemed like forever. 2 hours for each drape to be exact. You see, I painted them all by hand with no painter's tape to separate the black and white lines. Talk about needing a steady hand. I was too worried if I used spray paint or even regular paint with the tape that it would bleed and I wasn't willing to risk it. 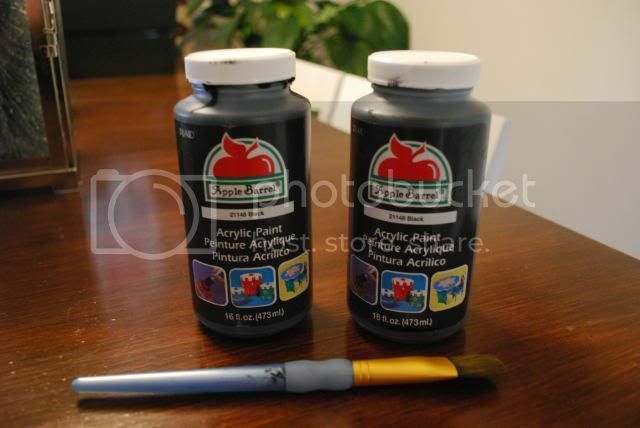 I made a little trip to my favorite and pricey craft store and picked up a stiff brush and two bottles of black paint. I made sure that the paints were safe for fabrics and that's about it. I barely have any left so my estimations were pretty close. And, if you've stuck with me this long, now here's the grand reveal! I've still got some arranging to do of my "stuff" which is on the agenda for this weekend! love the panels! They look great. They turned out wonderfully! Great job! SO gorgeous... you are inspiring me for sure! Love the curtains! 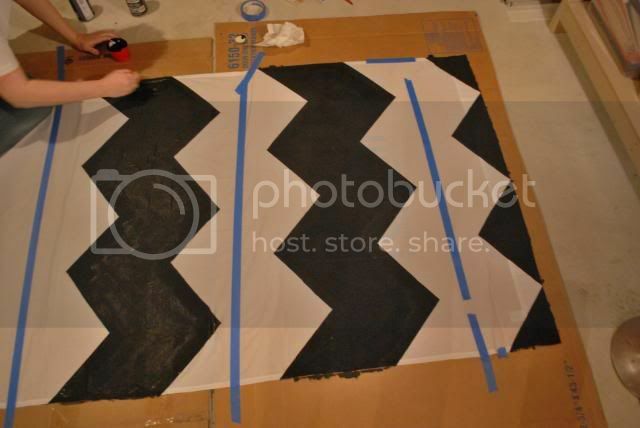 I am making black and white chevron curtains for my daughter's room - luckily I found some cheap chevron fabric. I don't think I have the patience to paint them myself! Can't wait to see the rest of the room! Oh wow - the drapes are perfect in the room! It looks gorgeous! I'm looking forward to whatever else there is to come! It looks great! I'm glad you decided to do the print on something less permanent! I have horrible flashbacks of my grandma trying to explain to me that blue matching sink, toilet, and tub were the "in" thing!! those are pretty much awesome. they look really good. can't wait to see the whole reveal. Love those curtains. You've Inspired me! wow, it's really coming together--love it! They look great, Joi and I admire your patience for that project!! The curtains are the bod-a-bing for the room. They really make it! I've been contemplating for a while how and where I could incorporate that cheveron zig-zag in to my house. Love what you did! Fantastico! These turned out great! They make such a statement in the office. This is FANTASTIC! Way to go! Those curtains add a wonderful funky element to the room. Those do look great...as does the rest of the office so far...can't wait for the final reveal! It just keep getting better & better! WOW! They look great. Hard work certainly paid off for you. It keeps getting better and better! I LOVE THEM!!!!! GORGEOUS GORGEOUS GORGEOUS!!!!!! The chevron looks professionally woven, too! Even better w/ the pops of turquoise from the lamps. Give me some of your patience, b/c I could have never endured painting w/ such a steady hand! Blame it on my coffee shakes, LOL. amazing! 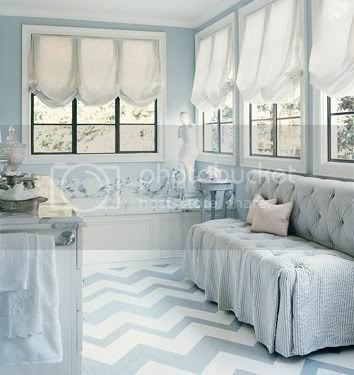 i love a good chevron print and this looks fantastic! STUNNING! Ahhh, what a fantastic chic office space! Every piece is absolutely gorgeous, Joi! They look awesome!! Both of you did a great job the hard work def paid off..
B. You have far more patience than me, but I wish I had it. They are awesome! what!! they look amazing in the room! love em! so cute have to a tutorial plz!!!!!!!!! Well done! Wow.. your office is looking wonderful! wow...great job joi...can you do mine? This looks SO SO good! For some reason I can't see your images at work, but I'm glad I checked tonight, it's amazing! The colors, and that credenza. and the drapes! Really good! Wow! I love the drapes and how everything is coming together so perfectly! This is SUPER NICE!! I love the drapery panels! You go girl! These look awesome!! Looks awesome!! Hard work well paid off. I love them and they make an awesome statement in the room! Great job as usual Joi! your office is looking wonderful, I cant wait to see the rest. OMG, those look awesome! 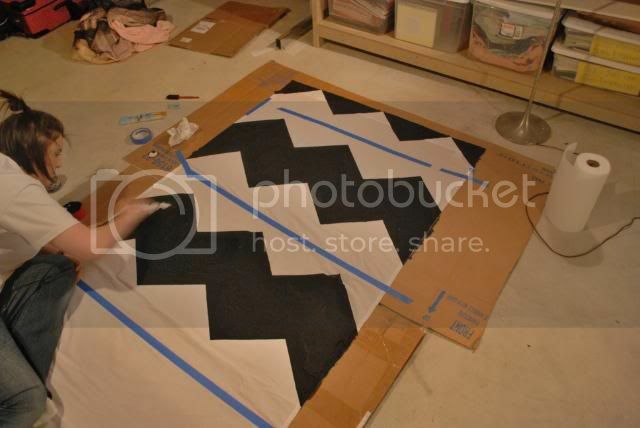 I just did a zig zag rug in a similar way! The floor of that bathroom in your photo left me speechless ... can you say yummmmm? The curtains for your office turned out terrific - I can't believe they are painted! Great blog, and thanks for the inspiration..
LOVE your space! You guys have done a great job on it! I blogged about your space over at www.lauraburciaga.com! Check it out and leave a comment! These are amazing!! I just blogged about your project over on my blog, Pretty Patterns!! Not trying to sound ghetto here but Im working on a super limited budget and wanted your opinion on something. Do you think that if I did this same painting job on white flat sheets and made them into curtain panels they would hold up? 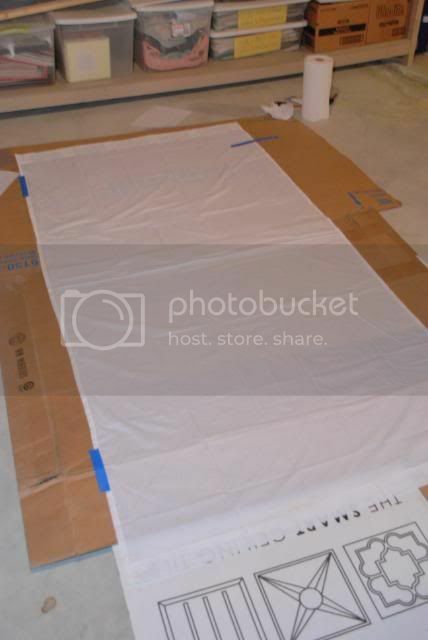 $5 per sheet is alot less than even $20 a panel. Please let me know your opinion. Id love to use your office as an inspiration room for my sewing studio! These are GORGEOUS!! And oh so dramatic! I love them :) I usually just stick with white linen drapery, but you're quickly convincing me to take a risk! Wow! These turned out great! We just installed some teal and beige chevron curtains in our bedroom. I'm not sure if I could handle the patience of painting them! 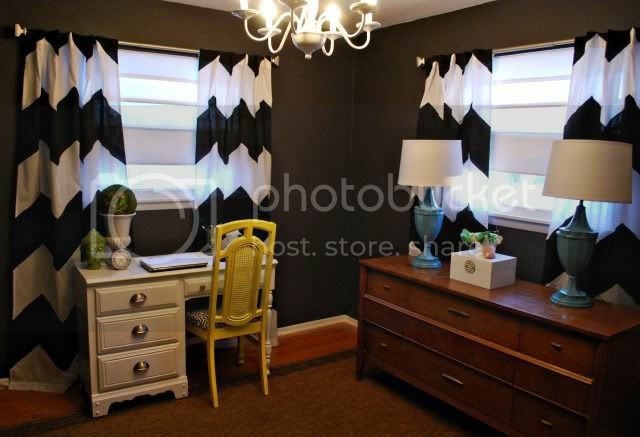 I just love the look of chevron curtains though. Thanks for sharing! Hi I just love what you did with the curtains they look fabulous! I have been shopping around to see if I could find the thickness of the chevron but, no luck:( so, I have decided to do what you did! I wanted to ask you for some help... What is the measurement you used to figure out how thick each stripe would be? I have the same length and width as you but, have no clue where to start! I hope to hear from you soon and thanks again for inspiring me to do this! :) sincerely, Maria P.
Featuring your super cool project on my blog... that is how much I loved it.... take a look.